Sometimes, even the smallest of defects can affect your car’s performance. Regular car servicing is not enough to prevent some unwanted defects which can be the result of worn out or substandard parts in the car, collisions etc. That is why car repairs are required routine operations when a problem with your vehicle occurs. What is more important is to choose the right workshop that will take care of your car when help is needed. 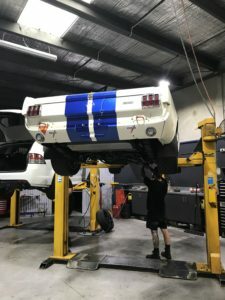 Fineline Automotive has a team of experienced mechanics who are ready to respond professionally to any task associated with repairing or replacing any parts of your vehicle. We are here to address and resolve the most common problems such as balancing or replacing worn tires, cooling or heating system problems, timing belt replacement, manual or automatic gearbox repairs, filter changing, battery checking, charging or replacing, oil replacement, steering system repairs, engine repairs, and pretty much any other areas in your vehicle’s systems. We use only high-quality parts from well known and proven manufacturers as part of our repair process, so even if you have a new car, your new car warranty will be kept unharmed. We guarantee that any type of repair will be done efficiently and in the shortest period of time at a competitive price. Bring your vehicle to our workshop and see why we are recognised by so many satisfied drivers. Your car will always be in safe hands with the Fineline Automotive Services team.